The decline in global music sales is "significantly slowing", according to the International Federation of the Phonographic Industry (IFPI). Figures show sales fell by 3% to $16.3bn (£10.2bn) in 2011, compared to a 8.9% fall in 2010. While physical sales dropped by 8.7% to $10.2bn (£6.38bn), digital sales rose 8.0% to $5.2bn (£3.3bn). Overall, digital sales made up 31% of all recorded music revenues, compared to 29% in 2010. The US remained the market leader with revenues falling just 0.1% last year to $4.bn (£2.8bn) and digital sales accounting for a majority of turnover (51%) for the first time. Japan remained in second place, with Germany third and the UK fourth. In the UK, music revenue fell 3% in 2011 to £889m, an improvement on 2011 when total music sales fell 8.9%. Physical sales dropped by 14.1% to £518.9m, although digital growth offset most of the decline with a 24.7% rise from £227.9m to £284.3m. Meanwhile, digital subscription revenues grew 47.5% in the UK last year and 65% globally to 13.4m users. "2011 was a significant year in the evolution of the digital music business," Edgar Berger of Sony Music Entertainment said in IFPA's annual Recording Industry in Numbers report. "The rollout of legal services to new markets, the continued expansion of subscription services and the revolution in portability have all contributed to the accelerated growth of the digital music market. The outlook is bright," he added. 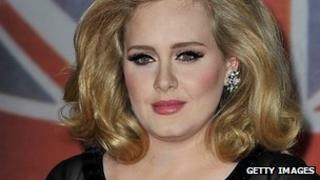 The report also listed the best-selling albums of 2011 worldwide which was topped by Adele's 21, shifting 18.1m copies. Michael Buble's Christmas came in at two while Lady Gaga's Born This Way was the third best-selling. Meanwhile, Bruno Mars scored the top two global best-selling digital songs of 2011 with Just The Way You Are and Grenade, selling 12.5m and 10.2m copies respectively. LMFAO's Party Rock Anthem was the third most popular global digital song, selling 9.7m copies.